Oh yes, in 2017, everything is possible. 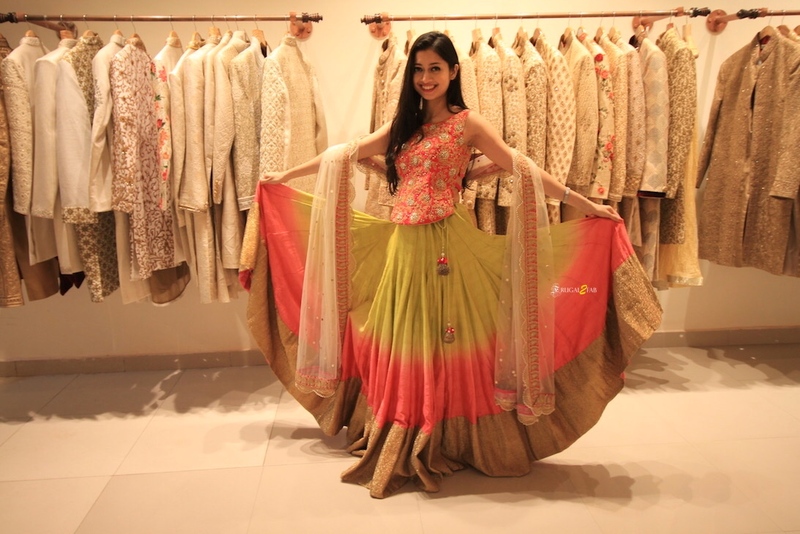 Remember that one time when I visited the Flyrobe Wedding Show in Delhi? Well, I took my sis-in-law with me, and it was probably the best decision ever. You see, when we reached Flyrobe store, I just couldn’t help but play dress up at their store. It got me thinking, wouldn’t it be nice for me to show you’ll how to be ready for 5 different wedding functions in just under 50k ! What kind of a bride doesn’t twirl at her own wedding? If you love full flared bright lehengas, then this stunning ombre shaded pop lehenga is the perfect pick. Cocktail/Sangeet night is all about being classy elegant, and this gorgeous blush pink anarkali styled lehenga by Niyoosh was a big favourite. It looks way better in reality as it does in pictures, so do give it a try. Nothing defines a wedding ceremony lehenga more than a gorgeous pastel gota lehenga. While the queen of gota lehengas is Anita Dongre, if you can’t afford her style then renting this outfit by Niyoosh is the closest best option for you. Have you seen the detailed post on this look on the blog? This was the last outfit I tried at Flyrobe, and it looked sensational. Glittery copper brown all net tulle evening gown, I felt nothing short of a princess when I put it on. I guess that’s the idea for reception outfit, isn’t it? If you want to wear top designer lehengas for your wedding, without breaking the bank, check out this gorgeous pop colour lehenga by Divya Reddy. It comes with a super cute baby pink jacket with embellishments which you can decide to put on, or take off…and the lehenga as is, is quite beautiful and striking. Probably my favourites from all the outfits at Flyrobe. This gorgeous baby pink jacket lehenga was the first thing I set my eyes on when I entered flyrobe. It’s not the obvious choice to pick, but boy, it looks so good when you try it on. Different from the usual lehengas, it’s a nice change to go for at one of your wedding functions. Which of the Flyrobe outfits was your favourite from this list?